The Toronto Blue Jays are off to a decent 10-10 start, good for third in the American League East. Although solid on the field, they have had some trouble off of it. In particular, the headlines have focused on their attendance figures dwindling to all-time lows at the Rogers Centre. I’ve now been to four home games, with last night’s 13-12 loss to the Boston Red Sox being the most-recent, and it’s pretty grim in the former-SkyDome. I don’t really agree with Blair’s assessment that the crowd was “uninterested”, but I do think that the numbers at Jays games are a going concern. After all, that crowd of nearly 14,000 fans was the fifth largest take for the Jays this season, behind only opening night (46,321) and any of the three games against the Los Angeles Angels two weekends ago. The Rogers Centre is averaging 16,032 fans per game this season, worst in Major League Baseball. Although it is worth noting that the Jays are drawing only one fan less than the Cleveland Indians. Still, this is a significant drop from 2009’s average of 23,162 per game, 22nd in the league. There’s been a lot of speculation as to why this might be, including the accusation that Canadians are uninterested in baseball. These theories may or may not be true. 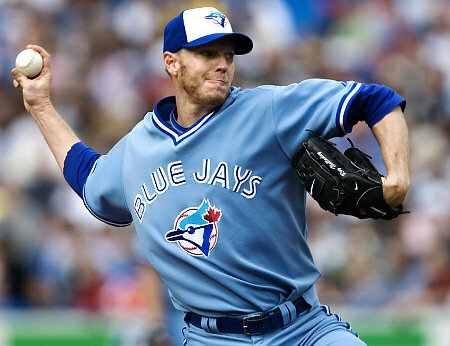 Personally, I think it can be summed up in one name: Roy Halladay. It’s not just that the ace pitcher gave the Blue Jays a nearly-guaranteed win every time he pitched. It wasn’t all about the hypnotically rhythmic pace Halladay keeps. It’s not just that he was arguably the most popular player on the team - although all that is true. No, it’s because Halladay’s departure signalled to the Toronto fan base that the Jays’ management just didn’t care anymore. It was as plain as raising a white flag of surrender. The Blue Jays management was going to scrap much of the team and get little in return. The way J.P. Riccardi botched the contract negotiations with Halladay was particularly galling. When he tried to play the media into scape-goating Halladay, it just added insult to injury. This, coupled with the departures of solid players like Marco Scutaro and Rod Barajas, has deflated interest in the Blue Jays and alienated their customers. Winning can cure all attendance woes, but the Blue Jays need to reassure their fans that the franchise is putting its best foot forward and trying to stay competitive. The loss of Halladay, Scutaro and Barajas ruined that image and it will take general manager Alex Anthopoulos and the rest of the suits at the Rogers Centre a long time to recover from this past off-season.